On Thursday 8 December, Manchester Met students will #LightUp Fallowfield in an event that aims to highlight the anxieties behind walking home at night and bring together the local community. We caught up with Jess Mallard and Zuzanna Niska, third year Fine Art and Art History students, to find out more about their campaign. What is the #LightUp campaign? Jess: We’ve worked in partnership with the Students’ Unions at Manchester Met and the University of Manchester, as well as the local community, to put together a light installation hung from the streets, trees and railings in Fallowfield, emulating the Christmas lights switch on that happens in the centre of town. We really want to bring everyone together at the event, to raise awareness and highlight the fears associated with walking home at night. Zuzanna: Anyone can come along to the event on 8 December. To be part of #LightUp Fallowfield, go to the alley off Ladybarn Lane (behind Sainsbury's) at 19:00 armed with your own fairy lights, torch or even your phone light for the switch on and to be part of the installation. Afterwards, we’re inviting everyone to warm up at The Font Fallowfield. Jess: We are also looking for campaign reps to give people information on the night. We’re holding a briefing session for this on Monday 5 December, so email us at lightupfallowfield@gmail.com or message @LightUpFallowfield on Facebook for more details. Jess: It sort of came from the sense of anxiety and fear amongst students, because of the number of sexual assaults that are happening to both males and females, and the sense of not being able to walk around at night without being afraid. I initially thought of the idea of a light switch on when I was considering getting a taxi home and was thinking about the Christmas lights that are being switched on in towns all over the country. I just thought how ridiculous it is that there’s all this emphasis and money going on to switching on Christmas lights when the reality for us is that we can’t even go home on our own without being worried. Zuzanna: As we are Art students, we thought of doing a light installation to kind of highlight our fears and stand in solidarity with one another. We’re going to prepare some lights that will be put in the area and also encourage people to bring their own lights, all battery run, and have a big switch on. And hopefully it’s going to lead to something even bigger – we’ve got loads of ideas and if it’s popular then we want to run some other events like workshops and discussions in the future. Finally, what would you say to other students who have a campaign idea and want to make it a reality? Jess: I’d say don’t be down on yourself thinking that you won’t be able to achieve anything because you’re a student. Initially, after I first thought of the idea, I was just laughing about it and thinking ‘Oh, wouldn’t that be nice’ and then the next day, after speaking to Zuzanna, we were like ‘Let’s just go and bob in The Union and see what they say’ and it’s just escalated from there. Zuzanna: Yeah, we were going to just ask if The Union would retweet about it and then it turned out that there’s actually a Campaigns Coordinator who deals with things like this – she helped take our ideas, put them onto paper and make them a reality. And we’ve also had great support from local businesses and organisations. Jess: Yeah, another piece of advice would be to email everyone that you can possibly think of for help and support, because we’ve been really shocked by how much people have wanted to get on board and how supportive the community has been. 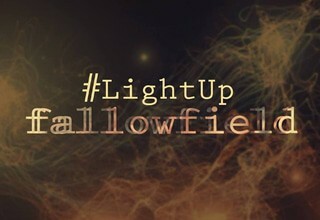 For all event updates, follow the Facebook page @LightUpFallowfield.